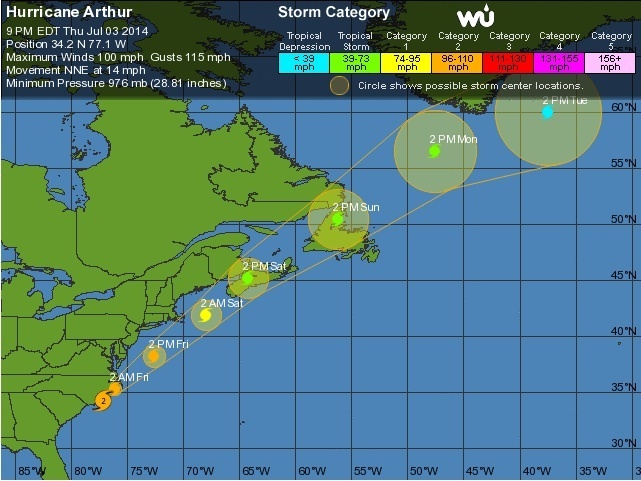 A current map of Hurricane Arthur's path. Image courtesy of Weather Underground. SUSSEX COUNTY – The effects of the impending storm coming up north, has left the Sussex County area with damage from the downpours this evening, including three injuries from lightning. In Green Township, reports of lightning touching down earlier this evening, caused injuries to three children. The children were airlifted to Livingston’s St. Barnabas Medical Center, where there is a sophisticated state-certified Burn Center. In addition to the lightning injuries, in Stanhope, there was pea-sized hail of .25 inches on Wills Avenue, reported from one of the site’s trained spotters. In Sussex, nearly three inches of rain has fallen as of this evening, per reports from the public. Click here for the full Weather Underground report. Now classified as a hurricane, the storm previously known as Tropical Storm Arthur is currently a Category One strength hurricane. The hurricane is expected to strengthen, and head into the North Carolina coast, as a Category Two Hurricane. Dr. Jeff Masters from Weather Underground is classifying the hurricane’s intensity as similar to that of Hurricane Humberto in 2013. Arthur has already showed its strength with winds at 90 mph. The weather for Newton is showing a chance of rain for tomorrow’s July 4 forecast, with a high of 74. Saturday is still showing sunny and clear, with a high of 81 degrees. The Flash Flood Watch remains in effect for Sussex County through tomorrow morning, with one to three inches expected. Periods of heavy rain are expected. Locally, a rain date has been set for the fireworks in Sparta for July 5 at dusk, should the weather be inclement on July 4. Seaside Heights is still reporting a Flash Flood Watch and a High Surf Advisory through Saturday, per Weather Underground. The High Surf Advisory spells out the possibility of six to eight foot waves in a twelve to fourteen second period. Riptides and beach erosion may occur. Hurricane Conditions are still possible in this area for July 4. Cape May, like Seaside Heights, has similar storm warnings. However, Weather Underground has reported wind damage in the area.